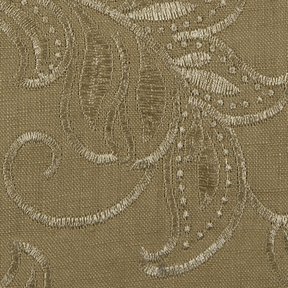 The product photo above is a 4 inch square section of Linen Lace Latte upholstery fabric. Linen Lace is a demur lace like pattern motif embroidered on a linen blend ground. Linen Lace coordinates directly back to Linen Touch Plain, Linen Leaf and Linen Floral. Great for top of the bed, window treatments and home décor.